I was recently asked, “ How to conduct a Virtual Book Tour ? “ Actually the question was, two-fold: Do you teach #How to Promote Your Book for Free? and if so, What’s the best way to market a book today? I ‘m sitting in a local coffee shop, with one of my friends, another author…We’ve been discussing Book Signing Events and whether or not they’re still as effective as they once were in the world of #authors. You see, as authors, we’re reminiscing about some of the challenges faced by new authors…in particular Christian authors . You see, book signing events can bring exposure and recognition, however, they must be well attended and that’s a challenge! Then there’s the cost of travel and advertising, finding the right venue, etc. They can be expensive and difficult to organize. Unless the Author has a strong following, the turn-out can be a huge disappointment. Over the years, I’ve heard a number of horror stories from my fellow authors devastated by poorly organized events set up on their behalf…but this beats all! The first was set up in his hometown, the second in the town of his University Alma Mater and frankly, I forgot where the third was setup, I remember only that each was set up in different towns in different states…hundreds and hundreds of miles from each other. “So you want to hear a real horror story?…I spent my own money, packed my car and drove the seven hundred miles from home to the first event. That one was in my hometown. I get there and my books aren’t there. We’d ordered plenty in advance and they told me they’d be there for this event. Well they weren’t. I wasn’t too worried. I had a case of books in my trunk. So I go get ‘em and start to put ‘em on the table, and the manager comes over and makes me put them away. ‘You can’t sell those books here’…he says. Can you believe it? I drove all that way, and I couldn’t even sell my own damn books… books I ‘d already paid for! It ’s that story that led to his questions…and my answers. I’m going to outline: How to Conduct a Virtual Book Tour. You could subtitle it: How to Promote Your Book for Free. 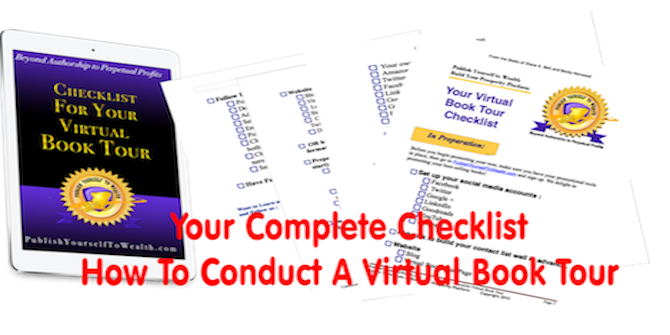 (Pick up your free checklist here.) Virtual Book Tours are an excellent way to share your message and present your book to your ideal audience… without all the expense and headaches of organizing a Book Signing Event. When you know how to conduct a virtual book tour correctly, you’ll find you can easily share your message, build lasting relationships with key influencers in your niche, drive traffic to your website, and sell more of your books, all while enhancing your own reputation as an Author. Done right…you’ll gain maximum exposure for your book, your message and your business. Your books are readily available world-wide, because of the internet. To make it even easier for you, Podcast hosts, radio talk show hosts, and bloggers are seeking published and soon-to-be-published authors to interview. Why? Because they’re looking for new and fresh content for their own readers. When they host you, as a new Author, they benefit from your interview as fresh content, and both of you will benefit from new readers. When you, the Author, know how to conduct a virtual book tour the right way, you’re both going to promote the tour. Your host enjoys new listeners… you gain exposure and a new audience and both of you win! The wonderful part here is your readers and listeners come away with new information about your message, whether it’s your ministry, your Christian novel, or your heart-centered business. You’ll sell more books both before and after the tour. More traffic to your blog, website, and social #media networks. Gain new readers and reach new audiences. You’ll enjoy the benefits of high quality links to your website…links that bring higher traffic counts to your sites and to your book-buying pages. Last week, I updated my favorite planning tool and was reminded how powerful and inspirational it can be when you take the time to work through it. If you really want this year to be your best, be sure to pick this up. Joint Venture With a Handshake – Grow Your Business Fast! Joint Venture With a Handshake - Grow Your Business Fast! joint venture (JV) is a business entity created by two or more parties, generally characterized by shared ownership, shared returns and risks, and shared governance. Less than 5% of established businesses have entered into such an arrangement. Suppose for moment, you've developed a high-end training program teaching others how to become a local business consultant. You're looking to expand your business. What if you could send a letter to the non-buying leads of a much larger company that sells training programs to become a real estate consultant. An example cited in Forbes, by Patrick Hull outlines the benefits such an arrangement can deliver...to both parties. "Take the example of a friend of mine ... He was looking to expand his business a few years ago and entered into a JV with a much larger company that sells training programs teaching people how to become a business finance consultant. The company generated thousands of leads a month and had a 7% sales success rate. My friend worked out a deal to have the larger company mail a letter he wrote to all the non-buyers (93% of the leads) at his cost and shared a percentage of the sales. These leads were all people interested in learning a skill – just not the exact one the company offered. He was able to gain access to the leads the other company generated at no cost. Both companies benefited because leads were not wasted and the larger company made additional profits with no additional expense while my friend made a killing with this JV. [#1] "
So have you generated a list of leads? Do you have a sizable customer list? You can certainly use this asset to grow your business, very quickly. Why not get a little creative here? . . .You already have a sizable list of loyal customers, right? Consider offering them a service or perhaps a catalog of services you've negotiated special pricing on, just for your "preferred customers"...you'll be offering them an opportunity to take advantage of special pricing, they'll feel they are really special, and you'll generate more sales for both yourself and your JV partner. Your customers know you and trust you. When you send a letter endorsing a service or a product, they trust your endorsement...they are three times more likely to purchase from your recommendation than if the owner of that particular product or service offered it to them directly. Here's a few more reasons to consider why joint ventures are so successful. You're sharing resources...mailing lists, products and services, therefore there is absolutely NO ADVERTISING COST. You can turn it around and have your JV partner send your endorsement to their list...their loyal customers respond just as yours did to his offer. You are developing new customers, clients to whom you can now offer additional products and services. You can easily set up a Joint Venture and create large profitable windfalls for both parties in a relatively short time. When done correctly, Joint Ventures are profitable for both partners. What other services and products do your customers buy either before or after they buy your services? What products or services would enhance their enjoyment of your product or service? Who sells a product you have the perfect companion to? Who are your competitors? Don't rule them out...you may be able to offer your product services to their non-buyers and vice versa. You may even be able to package both services for a remarkable value. Who sells to customers who fit your customer profile?...They may offer completely unrelated products or services, but their customers are perfect for you...What are their hobbies?...Their net worth?...Where do they live? Once you identify potential JV partners, you can contact them with your idea. My clients know the success of your joint venture is limited only by your creativity . 1. You joint venture with another business and supply the products or services. 2. You joint venture with another business that supplies products or services to your customers. 5. You connect one company with another that desperately needs the product or services of the other--as the middleman. When you're ready to contact your potential JV partner, if you know them personally, the best approach is in person if possible. Otherwise, simply pick up the phone and call them. If you don't know them personally, you'll want to contact them first by phone, postal letter, or an express mail package. I discourage the use of email for the first contact...it's simply too impersonal and unreliable. If contacting by phone, you want to keep your introduction brief and explain the benefit of your idea to their customer and to them. If by letter, of course, your first concern is getting your letter opened. 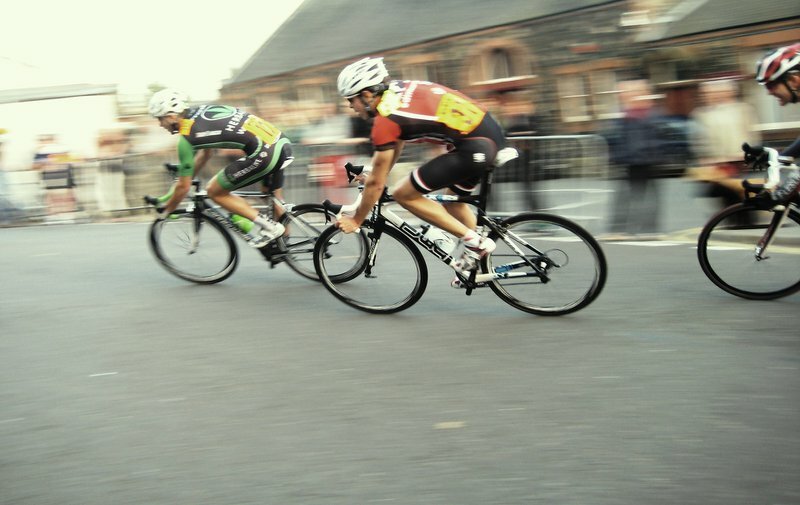 Let your prospect know how your product will benefit both them and their customer. Suggest they act quickly since you'll be contacting other companies in the future. When creating your offer, you'll want to develop a deal your Joint Venture partner will find impossible to pass on. The best way to do that?...You want to put together an offer so unique your market can't resist it. You want to build in value and offer it at a great price. Be sure to build in the value for your JV Partner. You'll want to make a list of everything that's in it for them. What are their benefits? What will the profit split be? Explain your role. How you will do everything, including taking on the risk. They have no investment to make. One very effective approach: "What we like to do, is work with other companies on a joint venture basis to do X;Y and Z. Do you have a moment to talk to me about it?" Remember: Sell the Results, Not the Process. Give your prospective partner a timeline. If they have an interest, I recommend you send a non-disclosure agreement prior to sending your proposal. By doing so, you position your proposal as having greater value, as well as protecting your ideas. Keep the deal simple. Focus on the benefits to your JV partner and their customer. Follow through and have fun! Bill O’Reilly’s personal story brings up a real issue for all #authors everywhere. His story (aired on Fox News) emphasizes a fatal flaw in the way books are listed on New York Times #BestSeller list. This isn’t the first time this flaw has been pointed out by the #media in recent times. Tim Grahl, posted an article in the Observer in February of this year, pointing out the “riddle wrapped in a mystery inside an enigma” when he referred to the NYT selection process for its bestseller list. O’Reilly noted the failure of his newest book, “Legends & Lies: The Patriots”, to reach #1 on the famed New York Times best seller list despite selling more (14,500 more) books, than “The Gene”, which was listed Number one in the same week. Is the NY Times Best-Seller List Honest? The Factor alleged that something is amiss with the New York Times important best-seller list. The new book "Legends & Lies: The Patriots' debuted at 1 on the Wall Street Journal and Publishers Weekly lists, but it is number six on the Times list. Also, 'Legends & Lies' has sold far more books than 'The Gene,' which tops the Times list. The Times editor refused an invitation to appear, but two publishing experts spoke about the list. "The Times plays games all the time with many of our books," groused Marji Ross of Regnery Publishing, "and many of our authors have experienced the same thing you have experienced." #Marketing consultant Tim Grahl agreed that the Times list is questionable. "They're selecting the data that fulfills what they are looking for, they are sampling the stores to make sure that the list leans the way they want it to list. The New York Times best-seller list should have a big asterisk!" The New York Times samples its own list of book sellers across the country. According to Tim’s article, a small group of people determine the data and criteria used to select the list. Why does this matter to you as an author? Because a BestSeller listing means more book sales, more speaking gigs and more money. 1. Focus on your audience and your reader. 3. Be sure to place your book in every format possible, everywhere possible. You’ll want to be sure you make it available on Amazon as a Kindle book, as well as print…and don’t forget about audio. Audio books can outsell print or digital books as much as 60%. Diane K. Bell is an award-winning 1 best selling author passionate about helping others achieve bestseller status and sell more books. Want to launch your own book to #1Best Seller? Contact Diane at 303-242-4461. Experts Get Ready! Here I come! My Friend Mike Koenigs just posted a great video on how to interview experts.